In March 2016, Little Elms started “Seaside Searcher” sessions with the children. 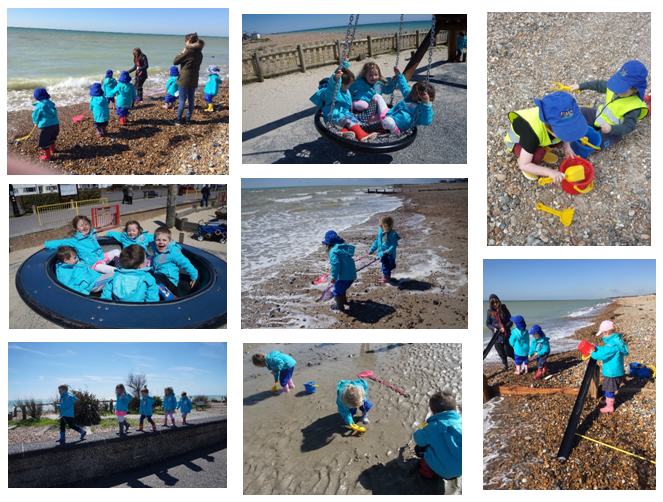 Small groups of children were able to make regular trips to the beach and beach park, in all weathers, exploring nature at its very best. • Outdoor learning in a dynamic space that changes with the tides and weather. • A reflection of the principles of the Forest School approach as seen in Scandinavia. • First hand experience of the local, natural environment. • Experiential learning that is real and follows the child’s interests and learning styles. • A focus on the use of naturally occurring objects as resources. • Time to engage, wallow in and reflect on the experience. • A social occasion and lots of fun!